The Kansas City Royals’ Jeremy Guthrie started September with another strong start as his team battles to win the AL Central. 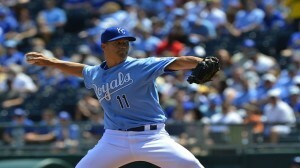 Guthrie gave up just 1 run and 8 hits over 7.0 innings against the Texas Rangers. But Royals fans are more concerned with Guthrie’s start tonight against their division rivals, the Detroit Tigers. If Guthrie can bring the same level of pitching, the Royals may be able to hold onto their 2-game lead. Also strong on the mound this past week was the White Sox’ Matt Lindstrom, who pitched a total of 2 innings in relief, giving up just 2 hits and no runs. 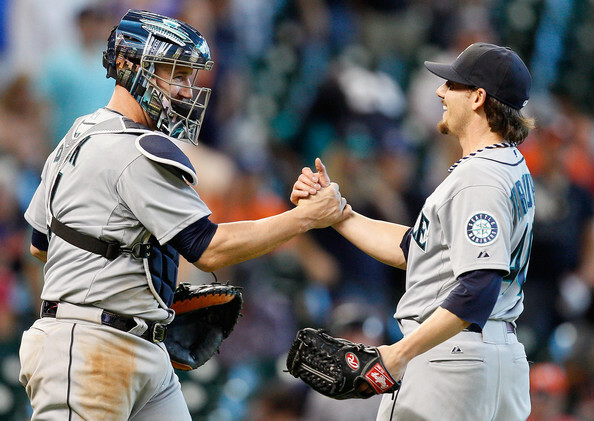 Unfortunately, the White Sox are well out of the post-season, so Lindstrom’s performance will only make a difference for his own career, not the White Sox’ season. Just as we learned that Mets reliever Carlos Torres comes from a Mormon family Torres had a gem of a week, including an “emergency” start in which he lasted 5 innings, striking out 6 while shutting out the Cubs. Overall, Torres lasted 6 and 1/3rd innings without giving up a run while striking out 8. Torres was nearly matched last week by the Royals’ Jeremy Guthrie, who notched his 10th win. Guthrie gave up just 5 hits and a walk (resulting in a single run) in an 8-inning start, giving him a 0.75 WHIP for the game. But this only reduced his era to 4.32 and his WHIP to 1.31. 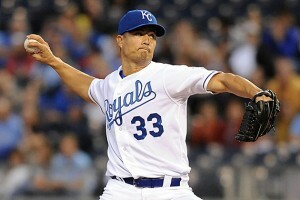 Royals fans must wish that this past week’s Guthrie showed up more often. After a few weeks of getting to the plate in dribs and drabs, the Texas Rangers’ backup infielder Adam Rosales finally saw some regular plate appearances, and responded with an exceptional week. Rosales was 7 for 14 (.500) last week, with 5 runs scored and 5 rbis on 2 home runs and 4 walks. And this past week’s performance boosted Rosales’ season average to .350, although on a mere 40 at bats. Rosales was far from the only Mormon player who performed well last week. Jacoby Ellsbury was hot, going 10 for 24 (.417) while the backup shortstop for the As, Eric Sogard, was 7 for 16 (.438) with 4 runs scored, 3 rbis and 7 walks. It was the best game of his year. Jeremy Guthrie blanked the Oakland As over 6 innings, striking out 6 and giving up just 3 hits and two walks. This performance marked the first time this season he shut out his opponents. Unfortunately, Guthrie has otherwise not been that good. His season era is now 4.50—which represents on average a run every other inning pitched. His strength remains in his durability; Guthrie has started 22 games for the Royals this year and has accumulated a total of 138 innings. Best among Mormon pitchers last week, Doug Fister continues his exceptional performance following his stint on the disabled list earlier this season. With a 2-run 7-inning (2.57 era) start this past week, Fister has his season era down to 2.90, good enough for 18th in the majors, if he had pitched enough innings to qualify. Perhaps the only black mark on the start was that Fister gave up his 7th and 8th walks of the season. Cubs second baseman Darwin Barney was great last week — better than any other Mormon in the majors. Barney held his own fireworks show, with his bat this time, on July 2nd and was short of hitting for the cycle by a home run. Barney was 8 for 21 last week (.381) scoring 3 runs and earning an rbi, and in the process raised his average for the season by nearly 25 points to .219—closer to his career norm. 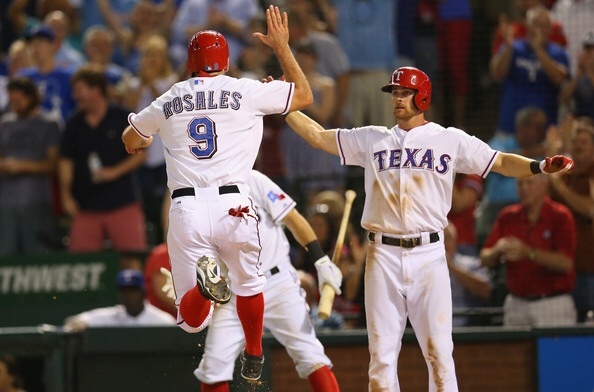 Close on Barney’s heels last week was Adam Rosales, brought up from the minors as a backup infielders for the Rangers. Rosales was 3 for 10 last week with 3 rbis. But given Rosales past performance in the majors, it doesn’t seem likely that he will be able to keep up that average. The standout Mormon in major league baseball last week was clearly Jacoby Ellsbury, who once again showed the best of what he brings to the diamond. Ellsbury was 8 for 23 at the plate (.348), scoring 2 runs and earning 3 rbis with 2 walks. He improved his average for the season to .348 and still maintained 5th place in stolen bases in the majors. 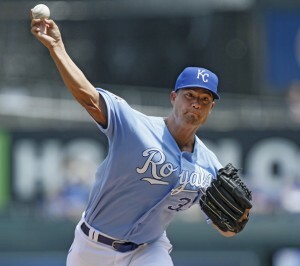 On the mound the standout last week was Jeremy Guthrie, who notched a win in two outings (totalling 14.1 innings) while giving up just 4 earned runs (2.51 era) and striking out 9. The win puts Guthrie one shy of even and gives him a 3.69 era for the season. Last week’s numbers were good, but while Guthrie’s season numbers maybe mediocre, his advantage is his ability to put in a lot of innings — Guthrie is tied for 10th most innings pitched in the majors. Even if the Royals could find a better pitcher to replace him (a questionable idea), they might be worse off if they needed to use the bullpen more as a result. Yes, Mormon outfielders like Jacoby Ellsbury and Bryce Harper are well-known and exciting to watch, but given last week, maybe fans should give some love to the Mormon pitchers active in the majors. Kyle Farnsworth, Doug Fister and Jeremy Guthrie were all stellar in the games they pitched—Farnsworth and Fister didn’t give up an runs while Guthrie gave up just one run in 6 and 2/3rds innings while striking out 9. And both Fister and Guthrie ended up with a 0.75 WHIP for the week. 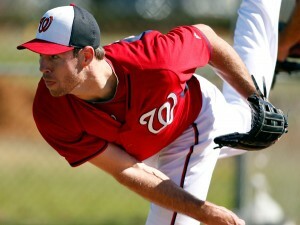 Fister now has a season era of 2.65. While it might not seem the case, playing well in a backup role is hard. Because the batter doesn’t see as many pitches, its harder to do as well at the plate. So, when a backup player is doing well, that is noteworthy. In that sense, John Buck’s current performance is great. He was 4 for 10 last week (.400), and his season average is up to .271 (on 59 at bats). Buck has only hit better than that in one season of his 11 year career, so it seems unlikely that he will keep up that level for the rest of the year—especially as a backup catcher. But his performance so far is still great. After falling into a slump that lasted most of the month of May, Jacoby Ellsbury stole his way back toward his customary performance last week, going 8 for 23 (.348) with 5 rbis and 4 stolen bases, despite an overall mediocre performance by his team, the Yankees. The stolen bases are particularly noteworthy, since they raised him from 11th in the majors last week to 6th overall. 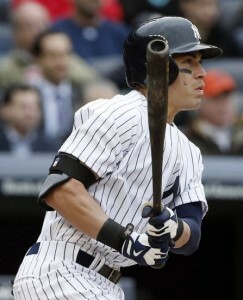 During his career Ellsbury has 3 times led the American League in stolen bases. He isn’t the only Mormon to do well at the plate last week. The As Eric Sogard also cracked .300 — going 5 for 13 (.385) with a run scored. But Sogard’s part-time role means he gets fewer plate appearances, and his record reflects that. And while Sogard is popular with fans, its hard to justify his presence in the lineup when he is hitting just .207 for the season. Ken on Which Mormon Hit Most Home Runs in Home Run Derby History? Th. on Which teams do Mormons like most? larryco_ on Which teams do Mormons like most? Copyright © 2019 Mormon Baseball. All Rights Reserved.